This chicken soup recipe is so easy and so laughably cheap that... well, it just makes me laugh out loud. The direct prep and labor time is well under 30 minutes, and the rest of the time you can let this soup simmer on the stove while you do other things. Not bad. And, at well less than a dollar a serving, it's yet more proof that healthy food absolutely does not have to be expensive. It's simply amazing to us here at CK that a soup this simple could be this good. I hope you enjoy it as much as we do. 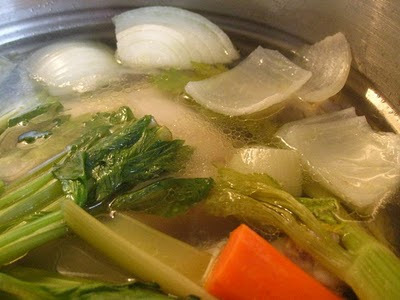 1) Place whole chicken and half of the carrots, celery and onions into a large stock pot (save back the remaining half of the carrots, celery and onions until step 2, below). Cover with cold water. Bring to a boil, reduce heat, and simmer for about two and a half hours, or until the meat falls off the bones of the chicken. 2) Remove the chicken from the pot, pick all the meat from the bones, discard the remaining bones. Add the meat and the remaining half of the carrots, celery and onions back to the pot. Add black pepper and optional bouillon cubes, and simmer for another 20-30 minutes, or until the newly added veggies are cooked to your liking. 1) If you have a stock pot with a large pasta strainer insert in your kitchen, I recommend using it for this recipe. It will make things a lot easier. Instead of having to lift a boiling hot whole chicken out of a pot of boiling hot broth--and risk burning various body parts in the process--you can just lift up the stock pot strainer, let it drain and cool over another pan, and then go to work on picking apart the chicken. This is an instance where the right tools can make a recipe a heck of a lot easier. 2) The first time we made this we were wondering how long would it take for the meat to "fall off the bone?" How would we know it was ready? And after the first hour of simmering, we worriedly poked and prodded the chicken expectantly nearly every 10 minutes. ("Is it falling off the bone yet? How about now? ...Now? What about now?" and so on). We needn't have worried. After the two and a half hour mark, the meat really did start falling off the bone--it was painfully obvious when it was time to pull the chicken out of the pot. Thus there's no need for you to repeat our worried poking and prodding. You'll know when it's time. 3) A quick note on why I divide the carrots, celery and onions in half, adding half at the beginning and half later. The veggies play an important role in forming the taste of the base broth, but after spending more than two hours boiling, these guys are going to get pretty mushy. But by adding another half-portion of veggies for the last 30 minutes, you'll get a rich flavorful broth and some bite to your vegetables too. Try it and you'll see what I mean. Total: $7.65-$8.65, or about 77c-87c per serving. I do the same thing with my soup -- adding fresh veggies at the end. It really brightens things up. Oh, you caught me just as I've been craving chicken soup! I haven't made any in a while, and once I get a craving, I can't let it go. Thanks for the push I needed to make some! Love how simple this is. These are great ideas! Thanks for sharing. And yes, there is something simple and comforting about this soup that just works. Thanks for the input and ideas for variations! Yummy! This is pretty much how I do it, too. Hard to mess up. I like to add egg noodles :) Also I try to strain off some of the fat when I remove the chicken. Sometimes if I know I'll be in a rush the next night and will get home late, I make the broth the night before (after dinner), then take out the chicken and veggies, and stick the pot in the refrigerator. The next night, I can easily remove the solid fat layer from the top, then chuck in the rest of the veggies, let them cook, then add in some of the shredded chicken and egg noodles. Great recipe and ideas. Thanks for posting this one. I love good recipes that are easy!